Is it odd that I'm showing you my bathroom? I haven't shared this room because I wasn't sure. 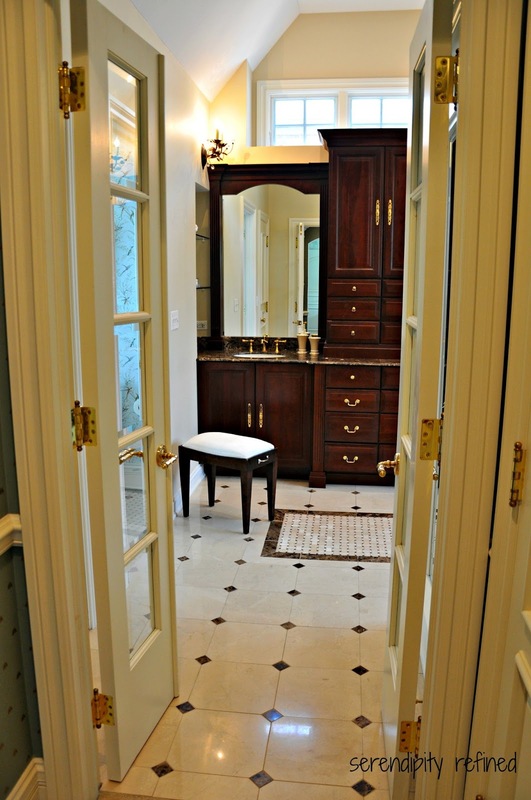 Until today, only my family and a few very close friends have ever seen our master bathroom. It's en suite; through the dressing hall, past our closets. 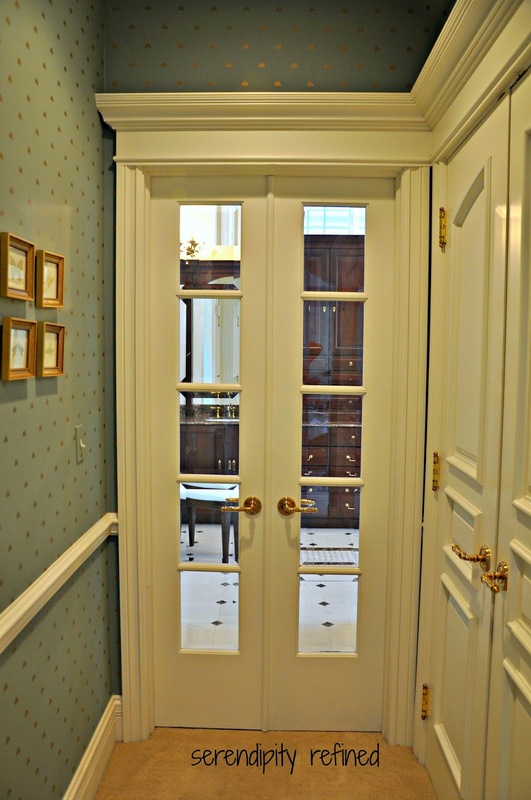 It has french doors to allow the natural light to fill what would otherwise be a dark hallway. 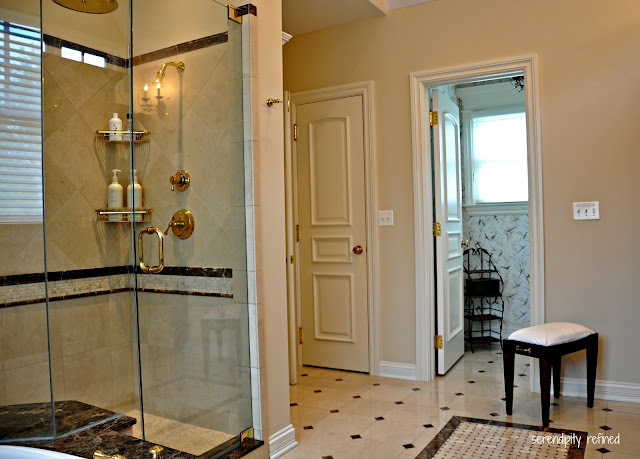 I designed our master bathroom long before we ever broke ground for the construction of our home and yet, when we moved in, 18 months later...it still wasn't finished. 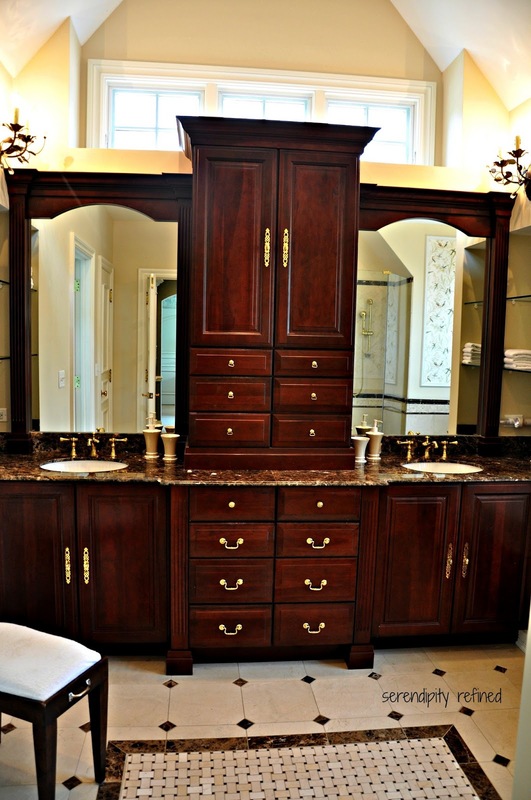 The cabinets weren't the issue, they are just some stock cabinets with a cherry finish. 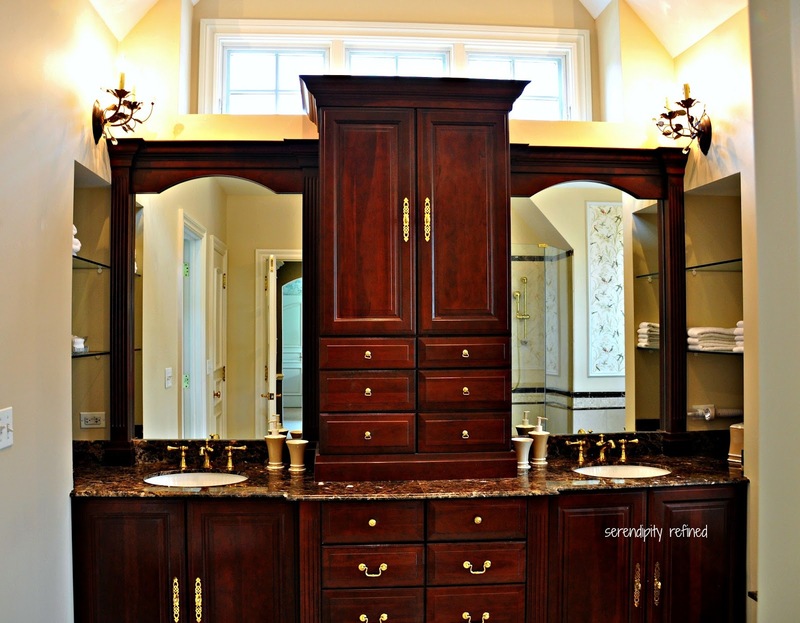 For the lower portion, I ordered stock sink base cabinets and two narrow banks of drawers. 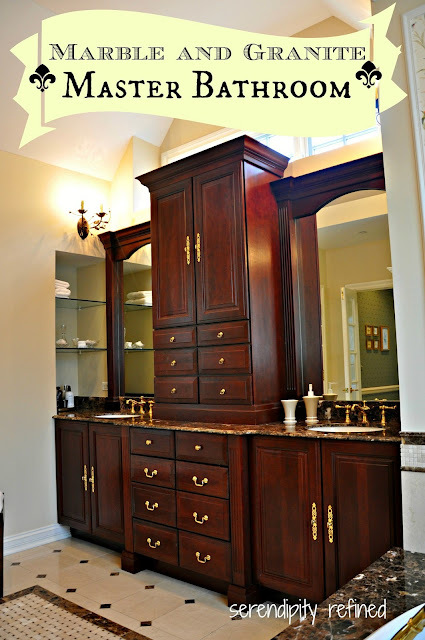 We pulled the center cabinets forward to create the impression of a dresser. The top consists of a double set of drawers and two narrow, upper cabinets which were stacked and screwed together. 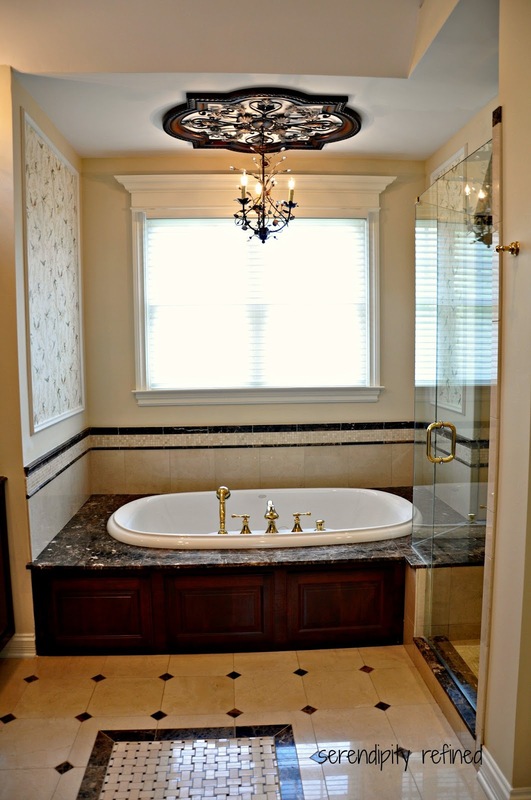 The whole unit was then wrapped with crown molding and some base to make it feel like a single piece. 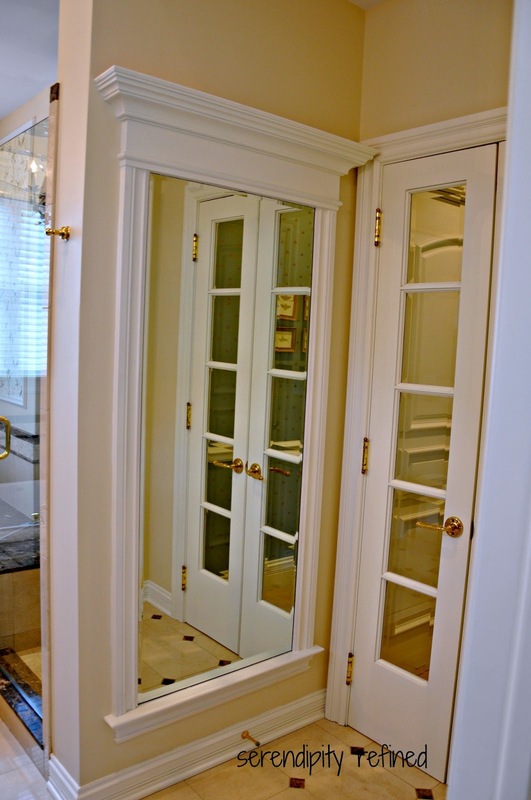 We built frames around the mirrors and used routed columns on the sides. The same column detail defines the center section of the base cabinets. 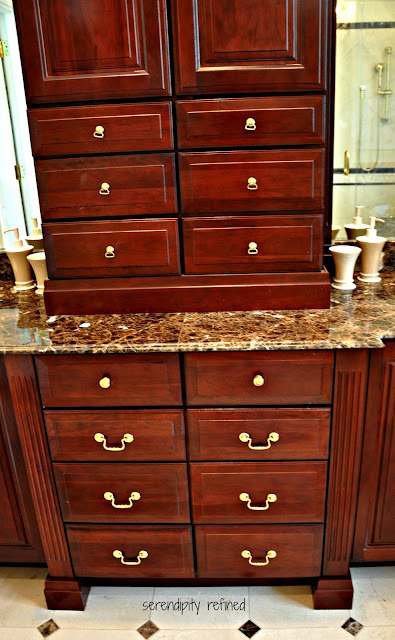 I used four different styles of pulls and knobs to create the detailed feeling of a piece of fine furniture. The majority of the bathroom tile is polished Crema Marfil Marble(the lighter color). We used 12"x12" tiles on the floor with the corners knocked off. The same 12"x12" tiles are set in a straight pattern in the bottom of the shower and around the tub. Then, they're turned on a diagonal on the shower wall above the chair rail. The shower floor is honed Crema Marfil mosaic. 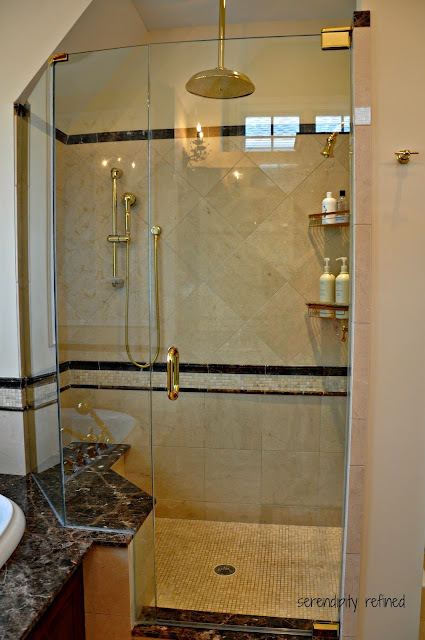 There's an accent strip of the same mosaic in the shower wall which wraps around the tub..
All of the Crema Marfil went in without incident...but then came the Dark Emperador Granite (the darker color). First, I couldn't order 2"x2" tiles for the insets for the floor so we cut them....from 12 x 12 inch tiles...with a wet saw. It felt like it took forever. Let me be clear, I designed the tile layout, I even helped cut some of the tile but I did not install it. 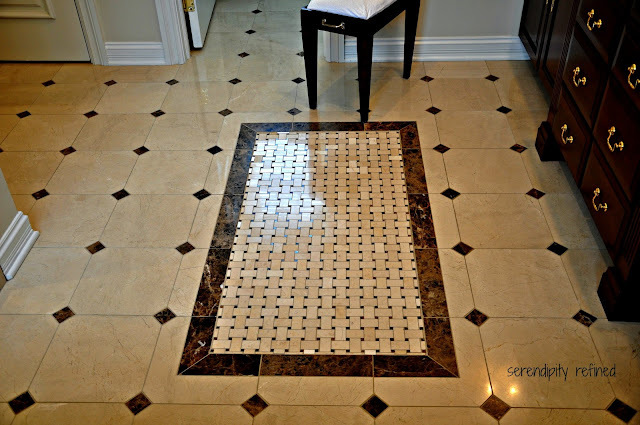 That magic was done by my friend, Scott from Westmont Tile. Then, there was the honed pencil liner and crown molding pieces which are around the top of the tub deck, along the top of the shower wall and on both sides of the mosaic accent strip. It had to be special ordered....from Italy. It came in wrong...twice...but we were still on target for having the master bathroom complete before we moved in. The Emperador Dark Counter tops and tub deck arrived and were installed a week prior to the deadline. Just when it looked like we'd make it, there was the "rug" that was tiled into the middle of the floor. The edge pieces were cut from the same 12 x 12 squares that we used for the inserts but the basket weave tiles were back ordered for almost ten months so we moved in but couldn't use the master bathroom for six weeks or so. There's one more thing that I love about this bathroom...it's a secret. Can you guess what's hidden behind these drawers? 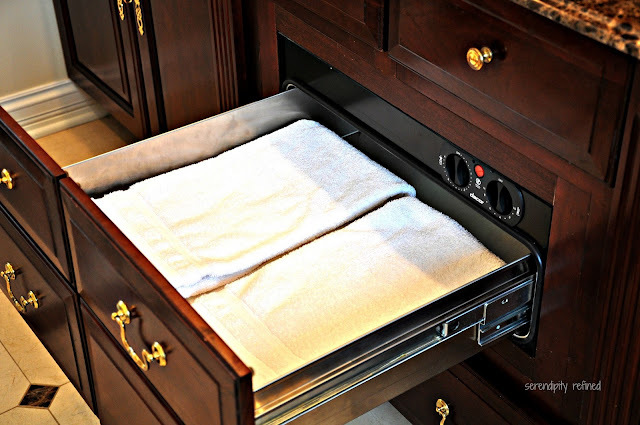 It's a built in towel warming drawer! Yep. I simply put them into the drawer when I turn on the water and, by the time I'm finished, they're toasty. This is especially nice in the winter time and my sons loved it when they were younger. I did learn, very early on, that the towels can't be folded too much or they don't get warm...they do, however, touch the heating coil, scorch and nearly catch fire. Yes, it happened...about a month after we moved in. It scared the daylights out of me and I've been more careful since then! 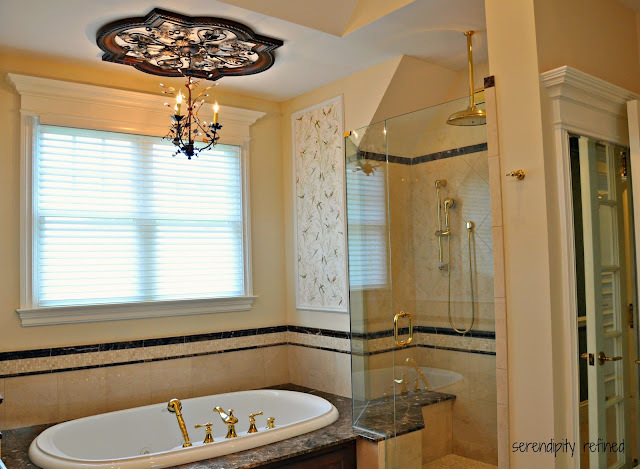 Other details that I made for our bathroom include the ceiling medallion above the tub. It was a wall hanging which I purchased from Z Gallerie. I used my Dremmel tool to cut the center out of it before bolting it to the ceiling. On the back of the shower wall is a built in mirror that's another of my repurposing projects. I salvaged the mirror when the house next door was torn down. Literally. When they tore open the side of the house, I spotted a beautiful, beveled mirror (and a pair of arched topped doors). I ran next door; pry bar, hammer, and screw driver in hand. I held up the tools and pointed to the mirror. Miraculously, the man stopped the wrecker and actually helped me to take them out. I hope that you've enjoyed this little peek into our master bathroom and that you'll visit again soon!